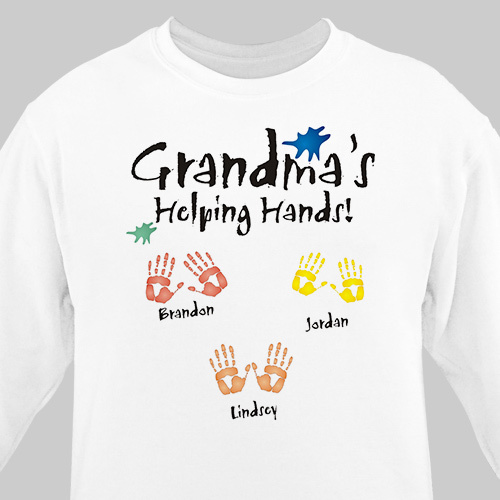 Display all your helping hands with our Hand Prints Personalized Sweatshirts for parents and grandparents. These one-of-a-kind Customizable Sweatshirts look great and show off your family pride every day you wear it. Each child's name is printed along with a set of hand prints on our premium cotton/poly blend Sweatshirt, machine washable in adult sizes S-3XL. Hand Print Shirts are available in white, pink or ash gray. Free personalization includes any title like Mom, Dad, Grandma or Grandpa and up to 30 children's names.